KATHMANDU, Sept 28: Prime Minister Pushpa Kamal Dahal has told the agitating Madhes-based parties that the government has been working to change the constitution and will soon finalize an amendment bill addressing their demands. 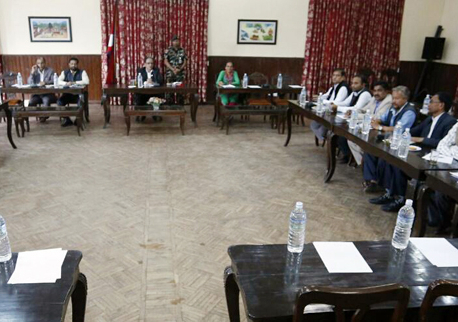 After the Madhesi leaders warned the prime minister that they were not in a mood to wait indefinitely, Prime Minister Dahal and Minister for Home Affairs Bimalendra Nidhi held a meeting with the leaders of the nine agitating parties on Tuesday and tried to convince them that the government has been working to fulfill their demands. The agitating Madhesi parties have demanded amendment to the constitution and withdrawal of cases against their cadres. "We asked the PM how long it would take to finalize constitution amendment proposal. We also asked him to set a deadline for withdrawing cases filed against our cadres during the Madhes-movement last year," said Rajendra Mahato, the chairman of Sadbhavana Party. According to Keshav Jha, the general secretary of Tarai Madhes Socialist Party, the PM has assured them that the main priority of his government was to address the demands of disgruntled parties in Tarai-Madhes. "The PM urged us to not harbor any kind of doubt. He also said that the amendment bill will be finalized in consultation with the agitating side. He also expressed commitment to try to register the bill before the Dashain festivities begin," said Jha. "Regarding the withdrawal of cases against our cadres, DPM Nidhi informed us that the Ministry of Home Affairs and the Office of Attorney General have been consulting concerned authorities and experts on the matter. Home Minister has assured that the process of withdrawal has already begun," Jha added. Madhes-based parties have also expressed serious objections over an understanding between the three major political parties to fix the number of village councils and municipalities taking the previous units (ilaka) as the basis for local restructuring. "We also asked the PM how the government could talk about holding local elections and finalizing local restructuring without settling the dispute regarding provincial delineation," said Mahato. "The PM then told us that he is fully aware that no election could be held without resolving the Madhes issues," he added. 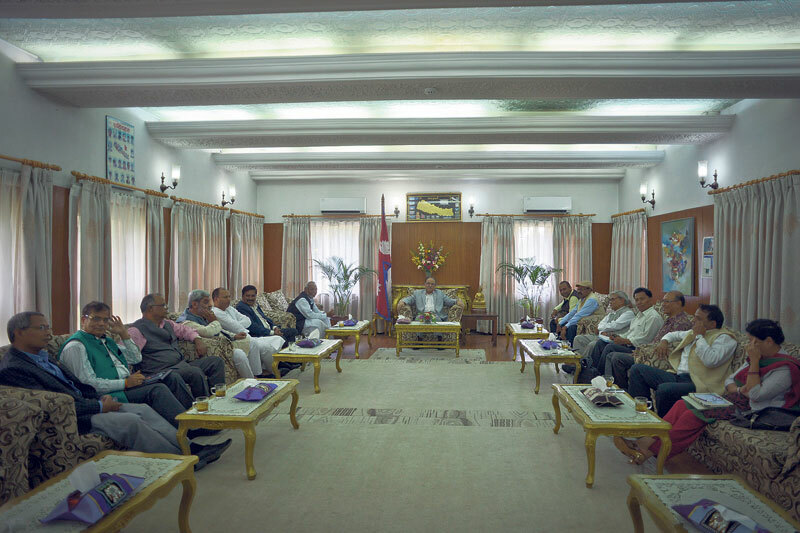 After speaking to the PM the leaders from Madhes-based parties warned him that they would not wait indefinitely to get their demands addressed. "We told him not to test our patience and force us to launch struggle once again," said Mahato. The PM's Chief Political Advisor Chakrapani Khanal said that the PM urged the Madhesi leaders to work with the government for preparing the constitution amendment bill.